With the cold of winter setting in, it’s that time of year many of us start to think about booking a holiday to hotter climes. While most of Europe succumbs to varying states of coldness, there is one place in the continent which enjoys an impressive 300 days of sunshine a year and the temperature rarely gets into single figures. 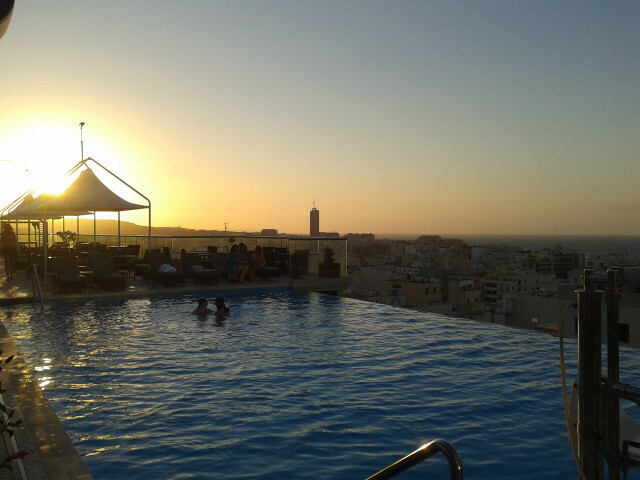 Last July, I booked a last minute holiday to Malta after admittedly not knowing much about the island. Located in the southern Mediterranean, Malta’s nearest neighbours are Tunisia and Sicily, so it’s no surprise to see the islands have a mixed heritage of Arabic and European. The Maltese islands gained independence from Britain after World War II, but there are still remainders of the country’s former occupiers such as red phoneboxes, postboxes and the British-style pubs. Despite our late booking, we fortunate enough to get a great deal for the five-star Palace Hotel in Sliema – a residential town across the bay from the capital Valletta. The hotel features a spa, three restaurants and a rooftop infinity pool and bar – which was a big draw during the hot July days, when temperatures were in the early to mid 30s. Sliema was a great base as it was so close to Valletta with good taxi and bus connections all over the island. While there are many good restaurants in Sliema, we often headed further out to the neighbouring town of St Julian’s and Paceville or took a taxi or short bus journey to Valletta. One particular establishment which stood out was Barracuda, situated in a stunning 18th century waterside house in Ballutta Bay. Eager to explore Malta’s culinary offerings, we ordered starters of Aljotta, a traditional Maltese fish soup, which was really unusual, but lovely. Overall, the food and service were brilliant and is a good locale for those looking for a special night out for their holiday. Another night, we walked a bit further from Sliema to Paceville, which has more nightlife. We had a delicious dinner at the Profumo di Ristorante Italiano, which served great traditional Italian fare. The staff could not have been more attentive and friendly and for a few hours, we actually felt like we were in Italy. However, we found Paceville nightlife (at this time of year at least) was targeted at a younger clientele, with most revellers in their late teens so it wasn’t really our scene. On several evenings, we ventured across the bay to Valletta, a 16th century city surrounded by its old fortifications. The capital was truly charming and we loved spending hours ambling around the sloping roads and alleys, gazing up at the domed cathedrals and different coloured wooden bay window-style balconies of the houses – a signature Maltese architectural style. While Malta is often visited by Brits on week-long holidays, Valletta could easily be a destination for a weekend city break. As well as plenty of attractions and shops, Valletta is the main hub of Malta’s busy festival calendar. On the week of our visit it was the Malta Jazz Festival. The annual event celebrates local talents and hosts some of the world’s biggest names in jazz. Although not regular connoisseurs of jazz, we loved sitting in the old harbour on a warm summer evening as the music soared over the water. For foodies, I highly recommend visiting Nenu The Artisan Baker – the only traditional Maltese restaurant in the capital. Located in a converted old bakery, the owners pride themselves on using traditional Maltese baking techniques to create ftira bread. Ftira is similar to pizza in a way and can be served with a variety of toppings, with lots of herbs bringing out rich flavours. We accompanied our meal with Kinnie – a Maltese soft drink made of various herbs and spices to create a bittersweet flavour. It’s quite a unique taste for a soft drink and left my friend and I divided on our opinion over it – I liked it. Our last night in Malta, we headed to the La Sfoglia restaurant in a marquee on Merchant Street. What drew us to the restaurant was the chalkboard menu, meaning the ingredients were fresh that day and the menu was changing depending on what was available – a more rustic approach to dining which I love. Like most restaurants in Malta, they served a lot of Italian cuisine and seafood. We opted for two courses of predominantly fish and seafood and were served huge, delicious portions at reasonable prices. Doted around Valletta were several pubs, but you may find the nightlife rather sleepy for a nightlife capital (more on that later). For those looking for more nocturnal activities, Malta is gradually gaining momentum as the next big clubbing destination with festivals and super-DJs coming to the island. The Isle Of MTV festival is popular, while new for 2015 is the AMP Lost & Found Festival in April. Along with festivals and the dance parties at beach clubs on the coast, Malta also has its very own nightlife village in the heart of the island. Located a short drive from Valletta and just outside the old capital Rabat, is the Gianpula complex. On site there were several open-air nightclubs and bars, including the latest addition Phoenix. A far cry from the tourist-orientated karaoke and disco bars from resorts St Paul’s and Bugibba, Gianpula’s clubs featured international and homegrown DJs playing a range of dance music for serious clubbing aficionados. The clubs had a friendly, glamorous Ibiza-vibe, but without the Balearic prices I was happy to discover, with spirits and a mixer costing around €3.50. Although we were based on the mainland of Malta, we were eager to exploring the neighbouring island of Gozo, which has its own cuisine and identity. With the help of the Malta Tourism Authority, we were put in contact with our brilliant guide Audrey Marie Bartolo, who took us on a day trip to Gozo. Before hopping on the 20 minute ferry ride to Gozo, we stopped by the historical village of Mellieha in northern Malta. We visited the cathedral, which features a fresco of the Virgin Mary, believed to have been painted by St Luke, and the World War II air raid shelter nearby. It was fascinating to hear about Malta’s involvement during the war and the horrific bombing attacks they were subjected to by the Nazis and the Axis. After crossing over to Gozo, our first stop was the Neolithic, megalithic complex of the Temples of Ggantija, which date back before the Pyramids. We were totally stunned to hear about the Maltese islands’ staggering history, with the oldest temple dating back to 3,600BC and its neighbouring one around 1,000 years younger. Our informative guide told us what is known about the people who built and used the temples and pointed out altars and fireplaces, where it is believed animal sacrifices were made. Much of our day trip Gozo was mainly focused on food. Heading inland, we visited the Ta’Mena Estate in Xaghra for a wine tasting session and ended up purchasing some of the condiments made on their farm. We also stopped by the Ta’ Savina Xewkija artisan centre to watch food and drinks products being made by hand in the factory, before having the chance to buy from a wide range of Maltese products in the store. One of the best meals during our whole trip to Malta was at Ta’ Rikardu wine bar in the old citadel of Victoria (4, Triq il-Fosos). We were fortunate enough to meet the owner Rikardu for a lesson in making the cheeselets from sheeps or goats milk. The smell of the cheese and herbs had really got our tastebuds going, so after our educational experience we popped next door into his wine bar which serves a simple, but delicious menu of homemade soup, ravioli and salads. Eating the cheeselets in the ravioli and accompanying the salad made a meal that bit more special after having witnessed the process that goes into making them. As our day on Gozo drew to a close, we stopped by the Qbajjar salt pans to watch locals scrapping the season’s salt. These particular pans date back to Roman times and it was impressive to seem them still being worked. After witnessing the hard labour which went into this centuries old tradition, I was intent on buying a bag to bring home as a gift for my mother from a small stand nearby. Admittedly, I went to Malta lacking knowledge of what to expect but was totally charmed by the islands. Aside from the obvious allure of good weather, the islands are full of history, architecture, culture and food. I’ve definitely added Malta as one of my favourite destinations in Europe and can’t wait to go back and see more. For more of Metro Girl’s travel posts, click here. Posted on 4 Jan 2015, in You can take the girl out of London... and tagged foodie, Travel. Bookmark the permalink. 1 Comment.